I have seen questions in the Jazz.net forum around how to manage public holidays or other scheduled absences for a large user base. I have heard this kind of questions from others as well. And thought a solution would be quite interesting, so here goes. Since I hate repetitive, boring, time consuming tasks as any one else, I wanted to do something about this for a while. In the context of this question two colleagues from Japan, Saitoh-san and Kobayashi-san approached me. They already had created a solution but were not sure how to publish it. They invited me into their IBM DevOps Services project to share what they had done. I looked into the code and found they had actually implemented an Eclipse Wizard to import scheduled absences for a user. Since I can’t blog about things I haven’t done, I decided to take a deeper look at what they had done and create a solution from there. I finally ended up creating some tooling that allows to manage single absences and collections of scheduled absences for one or many users. This image shows the scheduled absences added to a user. The code in this post is client API. This blog post uses internal API which can be changed at any time. If the Internal API changes, the code published here will no longer work. Warning, some of the code uses internal API that might change in the future. If the Internal API changes, the code published here will no longer work. The code discussed in this post can be downloaded from here. Please note, the code might change over time, although I hope to keep the interfaces stable. The source code of the Absence Manager is separated into three projects. 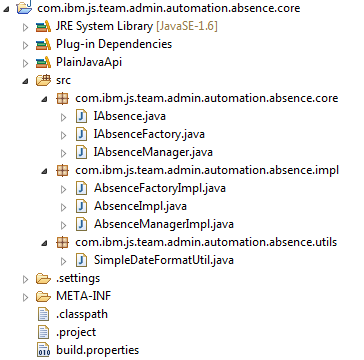 The core project com.ibm.js.team.admin.automation.absence.core contains all the code required to create tooling to manage absences. The package with suffix core contains the interfaces to work with, for most of the time. The package with suffix impl contains implementations for the interfaces that do the real work. The package with suffix utils contains a utility class that basically manages the conversion of timestamps and string representations. I ended up with this structure, because I wanted clear abstractions of the concepts and allow to easily enhance or replace the implementations if one so desires. Before I finally ended up with this clear structure, there where a lot of inter-dependencies in the code that where hard to handle. They tended to break the code when introducing small changes and where very confusing in general. This is by far the most complex automation I blogged about so far and I needed to be able to test it during refactoring. Once I had the first snippets available I used a test driven approach to finalize the solution. This also made the whole refactoring required to get to a clean structure possible in the first place. The project com.ibm.js.team.admin.automation.absence.core.tests contains unit test for the core classes and interfaces. The unit tests should cover most of the interface and its implementation. I did not make sure all is covered, but the main functionality should be covered. The third project com.ibm.js.team.admin.automation.absence.csv basically has two classes, that implement CSV import and -export of scheduled absences for all active (not archived) users. The classes can be used as prototype for a custom implementation. To read and write CSV files I used opencsv to avoid having to implement CSV reading and writing. This made it very easy to implement the functionality after the fundamental interfaces where working. NOTE: I will not include opencsv in the download. You can download it from sourceforge, unzip it and place the library in the lib folder of the project. There are other open and free Java implementations of CSV file readers for example SuperCSV for download as well. If you have a common system with an Interface to get at absence data, you can create an integration to that system with the attached code. Such an integration could, as an example, synchronize the absences between the other system and Rational Team Concert servers. The simplest approach would be to always delete all absences for a user in RTC and then recreate the absences from that system. This could be done in a nightly run. Absences are defined by the three attributes. To be able to find absences it is necessary to find one with the same summary and the same dates. While developing the Absence Manager, it became apparent that matching for the exact data is sometimes not desirable. Therefore the date is, in some cases, only compared to the same day, to avoid missing matches. For the summary the match is implemented as ignore-case. It would be easy to implement a way to find all absences by the summary. This would potentially be a collection of items. For the use cases so far it was not necessary to implement it and thus I left it out. During testing, when absences are manually created, the time created for the absence seemed to be 2pm in the timezone of the server. While specifying the absence the user actually only selects the date and not the time. If using automation, first check what the server would create and specify the times accordingly. The API to get absences is very easy. The code below shows how to access the scheduled absences for a contributor. All the code is hidden in the AbsenceManagerImpl. * Get the internal representation of all absences of a contributor. The code basically gets the IResourcePlanningClient to get the ResourcePlanningManager and uses this to get the IContributorInfo. This contains the absences as as well as the team allocations. The call .getAbsencs(IContributorHandle) returns an ItemCollection with all the IContributorAbsences. All the classes and interfaces, except IContributorAbsence are internal API. This is the reason why it should be encapsulated so that most of the implementation does not interfere with it. This will make it easier to adjust to changing API’s later. The data provided during creation is String and timestamps. Please note, this class is not part of the plain java client libraries but shipped with the RTC Eclipse client plugins in the file com.ibm.team.apt.common_*.jar. You need to add this jar file to your classpath, if you run this outside of the RTC SDK as described below. This code shows how new absences are saved using saveAbsences(). * uses a precision of a day to find matches. The code for removing absences is similar, only the call is to a different method – deleteAbsences(). * well as start- and end- date. Date match is don one a same-day basis. *            contributor to remove absences from, must not be null. *            collection of absences, must not be null. That’s it. Nothing big. But…. All the 9/10th rest of the code is basically to make it easy and convenient to manage the scheduled absences and to hide the internal API within. In addition tests and usage examples make up a reasonable amount of the code. The biggest trouble in the whole implementation was the conversion of date and time to timestamps. This occurs in several areas. The general problem here is that there is no general tool that is able to parse any string defining a date/time without problems. To overcome this, the AbsenceManager uses java.text.SimpleDateFormat. This requires a string expression to parse and map the external data to the internal representation. By default the mapping pattern used is “yyyy/MM/dd hh:mm:ss z”. However, this requires to provide date, time and timezone. If it is necessary, e.g. to avoid the time and timezone, a different mapping string can be used. To provide a different mapping string, use the second constructor of the AbsenceFactoryImpl and provide the mapping string as shown below. Please note, if no time is provided, the server will pick an hour on its own. The IAbsenceFactory provides also ways to create new absence instances with different representations. However, keep in mind that some comparisons are done internally and it is best to have a common schema. How to use the absence manager is shown in the classes AbsenceManagerTest and ScheduledAbsenceCSVImporter. You have to be connected to a team repository with a user that has sufficient permissions to read/write the absences. The interface implements a convenience method getContributor(String userID) to allow to get the IContributor interface, which also implements IContributorHandle, from the userId. You can get absences for a user. The code can be downloaded here. Save the code on the local disk. Set up an Eclipse client for example the RTC Eclipse client. 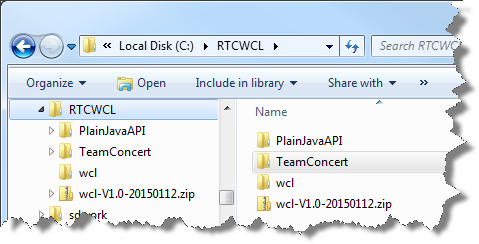 Follow the section Setting Up The Plain Java Client Libraries and Setting Up Your Workspace for Plain Java Development in the post Setting up Rational Team Concert for API Development to set up at least the Plain Java Client Libraries. You don’t have to set up the SDK to run the code. This step would however provide you with access to the API classes and their source code. 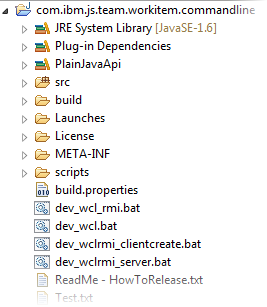 Make sure to create the user Library for the Plain Java Client Libraries. Import the compressed file as archived project file into Eclipse. The example does not ship the opencsv library. Download it by following the link e opencsv and clicking on the download link in the General section of the description shown below. Store the download file e.g. opencsv-2.3-src-with-libs.tar.gz in a temporary folder. Use 7Zip to extract the file. Use 7Zip again to extract the file content. Find the folder deploy in the extracted folder structure. E.g. C:\temp\opencsv-2.3\deploy and copy the enclosed JAR file e.g. 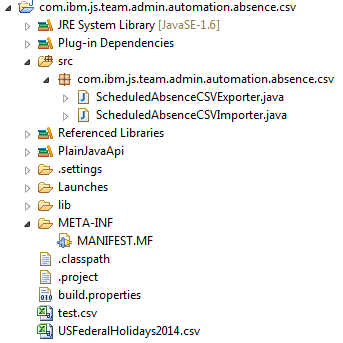 named opencsv-2.3.jar into the folder lib underneath the project com.ibm.js.team.admin.automation.absence.csv. Please note, opencsv also ships the file junit.jar. that is not the file you want. The planning component does not contribute any files to the plain Java Client Libraries. Unfortunately the interface com.ibm.team.apt.common.resource.IContributorAbsence that is used is part of that API. 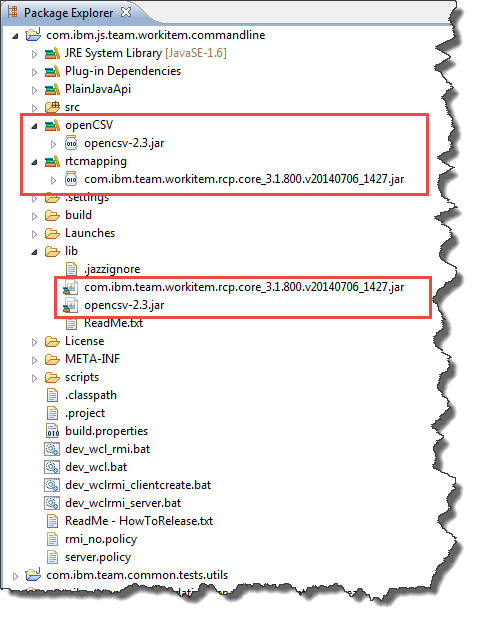 Similar to the opencsv jar file, find the files com.ibm.team.apt.common_*.jar and com.ibm.team.apt.client_*.jar in the Eclipse Plugins folder of an RTC Eclipse client installed from a zip file. If you install RTC with Installation Manager the files might be located in a shared folder. Find the file com.ibm.team.apt.common_*.jar and com.ibm.team.apt.client_*.jar for your version of RTC and add it to the classpath e..g. by copying it into the plain Java Libraries folder. For all the projects you just imported starting with com.ibm.js.team.admin.automation.absence.core. Run a clean build and check the build path for errors. If you used the proposed name PlainJavaApi, for the Plain Java Client Libraries user library you should be fine. If you see errors, you probably have a different name. In this case configure the build path. 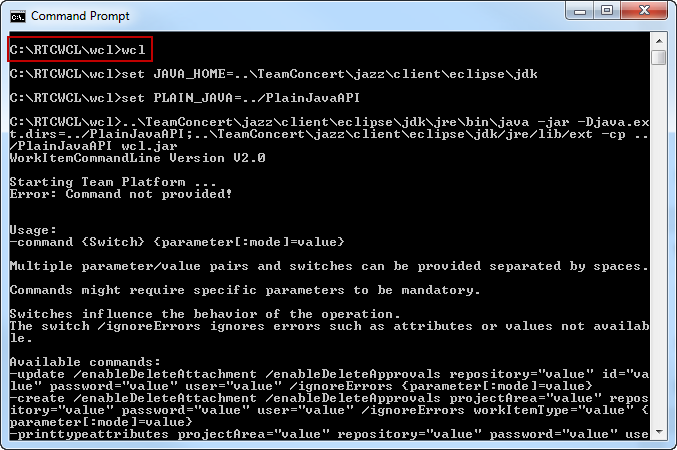 Remove the Plain Java Client Library user library from the build path and add your user library. Finally all errors should be gone. You are now ready to use the code and run the Unit Tests, the CSV importer and the CSV exporter. The code ships with launches. They are located in a sub folder named Launches in the projects.The launches should now be available in the Eclipse Debug Configurations and Run Configurations menu. Replace the information with your own values. Then you can run the importer and the exporter. The same information is required in the AbsenceManagerTest Junit test. It is hard coded in the AbsenceManagerTest. Replace the values with your own information if you intent to run the test against you own test system. I will try to find some time to be able to create a version that can be shipped as binaries with batches so that they can easily be run from the command line. In general the post Understanding and Using the RTC Java Client API should give you all the information you need to get this done yourself. This post provides you with all the code and information needed to automate managing scheduled and other absences in RTC repositories. The code is obviously not production code, so you should make sure it works as advertized in your environment. the provided tests should help you to fix errors, should they occur. As always, I hope this post saves users out there some time – or is at least fun to read. There is an interesting question on Jazz.net asking if it is possible to download and re-size the personalized user images in Jazz using the Java or Rest API. This post shows the Java API to do that. If you are just starting with extending Rational Team Concert, start reading this and the linked posts to get some guidance on how to set up your environment. Users can upload a personalized photo to their account in Jazz, to support easier collaboration. The images are loaded and displayed in plans. Today Jazz does not rescale the images that are uploaded, it just stores them. So the size of the photo uploaded has an impact on the UI in plans, especially in the Web UI. Related, this work item asks for the feature to crop and optimized photos on upload. In the meantime it would be nice if it would be possible to automate downloading, rescaling and uploading of the images. The Java API allows to do just that. You need to import the sources into Eclipse and provide the plain java client libraries as described in this article, in order to be able to run it. In this case a sample launch comes with the code. Alternatively you can compile the example code and provide the plain Java Client Libraries in the classpath. The code has been developed using the SDK to be able to browse the API better and is also configured as a plug-in. If you don’t have your Client set up with an SDK you can remove the file plugin.xml and the folder META-INF and all its content. Call ManageContributorPhoto.main with parameters repositoryURI AdminUserId AdminPassword where is down or up for download of the images or upload of modified ones. You can add another parameter pointing to a folder that should be used to store the images. For example “C:/temp/images/” or “/tmp/images”. Make sure to provide the trailing slash and make sure the folder exists. "https://clm.example.com:9443/jts" user password down "C:/temp/images/"
"https://clm.example.com:9443/jts" user password up "C:/temp/images/"
The Example ships with two launches as presented above that you should be able to use. Please be aware that the context root jts is not a typo. You want to change the users in JTS, which promotes the changes to all the other applications. Please check that the uid’s have been changed in the registered applications after running the tool. The tool downloads the available images for all contributors in the repository and stores them in a file created from the user name,the user ID and an extension ‘.jpg’ as shown in the image below. For uploading it expects the same format. It will not upload or change anything if no image is available. 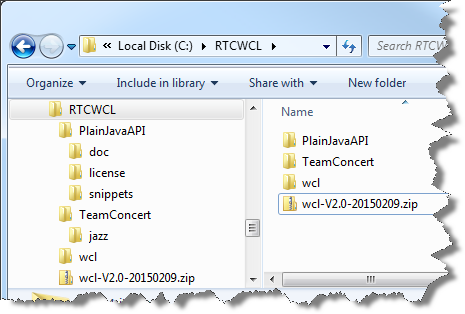 As already published, for instance in the post Changing the Jazz User ID Using the RTC Plain Java Client Libraries the information about the user is kept in a Contributor object. However, the photo image is not directly stored in this object. Instead there is an object implementing the IContributorDetails interface that has holds additional information to the contributor. These details also contain the reference to the picture or image we are interested in. The handle needs to be resolved or fetched to get at the data as usual. We will look at the details soon. The main code is done in the method run, which extracts the parameters, connects to the team repository and iterates all contributors of the repository. It calls the code to download or upload the image for each contributor based on the direction parameter provided. If the direction parameter down is provided the method downloadPhoto() is called that deals with the details. The code looks as follows. * made available in the images folder (by default the execution folder). * The Filename is composed from the base location user name, ID and the extension '.jpg'. The code tries to access the details of a contributor, gets the photo, if available, and tries to download the photo to a given file name constructed from the contributor information. The methods getDetails() and getFileName() are used by the upload and download code to get the details and construct the file name. The code of these methods looks as below. The method downloadSaveContent below, is used to download the image and store it in a local file. The way it is set up the whole operation fails if the file can’t be saved. * Download content to a given file. System.out.print(" " + filename + " download succeeded..."
+ " Type: " + content.getContentType() + " Encoding: "
+ content.getCharacterEncoding() + " LineDelemiter: "
This is all the code needed for downloading. Please be aware that the download uses the file type and encoding set for the content when downloading. If the direction parameter up is provided the method uploadPhoto() is called that deals with the details of uploading an image to the details. The code looks as follows. * Uploads a photo from an image file to the contributor. * default the execution folder). // Try to upload the image as content. The code first tries to upload the content from the file then it tries to get the details and, if there was an upload either uses the existing contributor details or creates new details if needed. It gets a working copy of the details, sets the photo content to it. Last but not least, it gets a working copy for the contributor and sets the contributor details that have been modified. The code of the method uploadContent() to upload the image and to create the content with the image is shown below. * Uploads an image to the repository and creates a new content. // Store the content with a meaningful content type, encoding and line delimiter. // If there is no image file, we don't upload one. Other than for the download, if the file for the image is not found, this code continues and just does not change the details. The code provides content type and encoding similar to what was downloaded. The code above allows to easily first download the images, then run some tool to scale them down and finally upload all the images for all users (that have an image) or even only for the images changed. I hope it is worth reading and helps some administrator out there to save some time. This post is about a Participant that creates an approval when saving a work item. I was interested in posting this, because I was interested on how to get at project member and role information in a server extension. I had already helped a partner with a similar effort in the past, where the approver information was supposed to be read in an external system. Back then I couldn’t find how to access the project area information and to find the roles. You can download the code here. The API code in this post is Server and Common API. The code provides you with several classes. 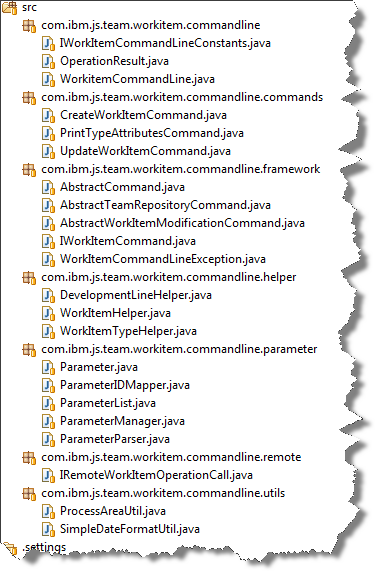 The interesting one is com.ibm.js.team.workitem.createapproval.participant.CreateApprovalParticipant. This class implements the participant that creates an approval if a workitem changes into the state "com.ibm.team.workitem.common.model.IState:com.ibm.team.apt.story.tested". In case this state change is detected, the participant runs the following code to get approvers by their role Product Owner. The method called to find the approvers looks like the following code. The code gets the process area that governs the work item. and tries to get contributors with matching roles. If there are no contributors that could be found with a matching role, it tries the same with the project area. The contributors are returned to create the approval. Please note, this strategy could be changed into recursively start at the project area an find the enclosed team area hierarchy and then try all team areas in the hierarchy from the one that owns the work item up to the project area. This is left as a good example for the you to implement. * then looks at the project area if it was not already looking at it. The code to find the approvers by role gets the members of the process area, then gets the contributors with the role name provided and returns the result. The code can be seen below. * Find contributors by role on a process area. Finally the code below creates the approval if there are approvers that are passed. It gets the full state of the work item. Then it gets the approvals and creates a new descriptor for the new approval. For each approver it creates an approval with the new descriptor and then adds it to the approvals. Finally it saves the work item. In case there are no approvers or the save is prevented, an error info is generated. The code to download contains other examples for how to get approvers. The code is experimental. I have tested it in a Jetty based test server using the Scrum template. It is by no means production ready and can be enhanced for various scenarios. However, as always, I hope the code is an inspiration and helps someone out there to save some time. If you are just starting to explore extending RTC, please have a look at the hints in the other posts in this blog on how to get started. This post is about a Participant that resolves the parent work item, if all children are resolved. It is the example I used to understand the server API for manipulating work item states. I would probably not use it on a production system, because I strongly believe that a human being should do a conscious decision in cases like that, but it is a nice example about the RTC Work Item Server API. The download contains the (slightly enhanced) UpdateParentDuration Participant described in this post, the UpdateParentStateParticipant and the WorkFlowPathfinder from this post as Eclipse projects. In Eclipse use File>Import and select Existing Projects into Workspace. Select the downloaded archive file and do the import. This version of the WorkFlowPathFinder has the Plain Java Client Libraries dependency removed and is treated as real plug in, to provide its services to the other plug ins. Please note, If you just get started with extending RTC, I would suggest to start reading this and the linked posts to get some guidance on how to set up your environment. Then read the article Extending Rational Team Concert 3.x and follow the Rational Team Concert 4.0 Extensions Workshop at least through the setup and Lab 1. This provides you with a development environment and with a lot of example code and information that is essential to get started. You should be able to use the following code in this environment and get your own extension working. The UpdateParentStateParticipant can use different strategies to do the state change. The code below shows some of the available options. The methods resolveBF() and resolveDF() use the Breadth First and the Depth First strategy against the resolve action. The method gotoStateBF() uses the Breadth First strategy but uses a target state instead. The method resolveWithResolveActionID() only tries to apply the action ID. You can play around with the different strategies and pick the one you like best. The resolve Action needs to be defined in the RTC work Item workflow as shown below, otherwise the state change can’t be done, because no path can be found. The WorkflowPathFinder class in the download provides two other ways to find a target state, instead of a target action. The methods are called findPathToState_DF() and findPathToState_BF(). The UpdateParentDurationParticipant is slightly enhanced compared to the state in RTC Update Parent Duration Estimation and Effort Participant post. It checks if there are changes to the duration and estimate values before doing anything else. The code also contains several methods to analyze the work item links on the server as described in The RTC WorkItem Server Link API post.